Balancing On My Toes: Florida Vacation: Outlets, Gator Bait, Twofers, and Movies! Florida Vacation: Outlets, Gator Bait, Twofers, and Movies! Oh thank goodness it's the weekend! This three day week felt longer then a normal week- I guess that's what you get when you take off on a long vacation! Let's relive last Friday shall we? The day started off with a trip to the local outlets. I'm so lucky that Tim is an enthusiastic shopper because we were able to go to so many stores within the outlets and both get a ton of great deals. So a shoutout to Tim for being a guy who doesn't mind shopping! I may do a haul at some point to share what I purchased, we shall see! Around noontime we headed back to the house where my parents lead us to our next planned excursion- an airboat ride! Our airboat ride was given by the company Gator Bait and it was incredible! Our driver and guide was awesome although we are blanking on his name currently (I think it was Bill? You can see him in the picture above with the visor hat). He showed us so many gators and knew his way around with ease. I didn't think it was going to be the most exciting event but I ended up loving it more then I ever could have imagined. If you are heading to the Vero Beach/ Sebastian area I highly recommend calling them up and booking a ride. Sometimes the gators were hiding out and were a bit harder to spot but we were always able to get super close to them. I love the above picture. This gator looks like he's smiling away! We learned so much about the area too. A lot of the areas the gators are sitting on are just patches on the water, not actual land. The gators find and make these areas so they can warm themselves up in the sun. They are animals that return to the same places every day so our guide had names for a few of them he sees every day on tours. Tim and a gator: You can see him poking his head up in the grass behind Tim. We had such a great time! The ride was actually very smooth, even with our driver flying over land and water and speeding in and out lanes on the swamp. The headsets we wore were great because our guide was not only able to talk to us but we were able to speak up if we saw something. After the airboat ride Tim and I headed back to the outlets to finish up some shopping and then took my parents out to dinner at Applebees! When you order an alcoholic drink at Applebees you get two for the price of one, which my parents refer to as "Twofers" we definitely enjoyed ourselves! We headed back to the house pretty early so Tim and I decided to go see Batman Versus Superman which was great! 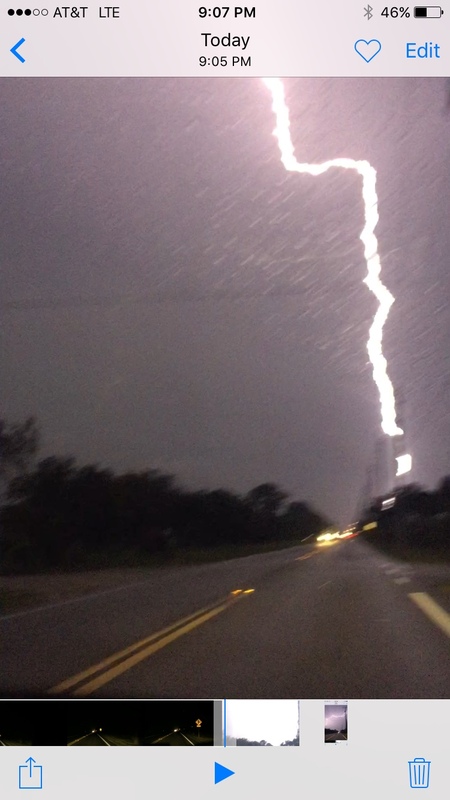 We both really enjoyed the movie and also enjoyed the lightning storm happening on our drive. So cool right?! After the movie we headed home to get some sleep because we still had THREE more days of vacation to enjoy! If you've ever been on an airboat ride let me know in the comments below! I'd love to hear about your experience!